i'm thinking these look more like wagon wheels than spiderwebs...this will probably be for our new baby, i don't think i want to give it away. Gorgeous! 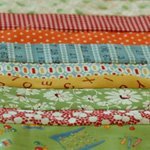 I'm starting a red, white and aqua quilt soon-- I wouldn't want to give it away, either. What a beautiful quilt - I wouldn't give it away either! oh, that's just sweet. Love your fabric choices. Love this in red and aqua. what a lovely quilt! it's perfect for a baby! That will make a sweet baby quilt. When is your baby due? Will you bind with a scrappy strip also? I love how you have all the white on the edges. smart girl. Yes, keep it for the new baby - it sounds better as wagon wheels than spider webs for baby too! nettie, this is soo lovely!! i would definately keep it! i LOVE it with all the white. It does remind me of wagon wheels--and I love it! Its so cute! Yes you should keep it for your new baby. very cute. Perfect for a baby! Wow...this is really cute! I love the colors. Love the blues and reds together. Your quilt is beautiful. I prefer it with less strips. I have not wanted to make a spiderweb quilt until now!!! I love it either way and whatever you call it... it is beautiful! This is really beautiful! I love the colors and I really enjoyed seeing the spiderweb design with some thicker/wider(?) blocks. This is beautiful! 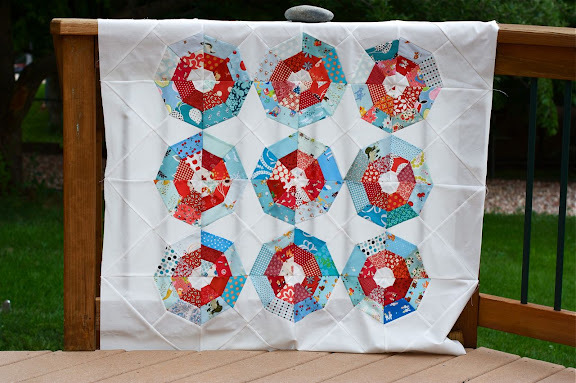 I love the fabrics you used and the red & acqua combo is fantastic. Ditto the rest of your notes - this is a keeper for sure! i LOVE the wide border! that's so so good! All those aquas and reds look so yummy against the white. Cute!!! Oh, you can't give it away - it is gorgeous!! Gorgeous i would not want to give it away either! That is beautiful, love the colors you used. It's gorgeous! I love the colours! whatever you call then they are great! Lovely...can't wait to see it quilted. Very cute! I love your quilts. You inspire me!